i don't often post on the weekends. but last night, i was doing my normal friday night routine. i was watching lifetime movies, and working on my laptop. 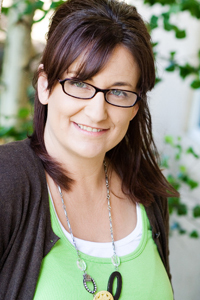 and i happen to notice a new post from becky higgins on her blog. i have been patiently awaiting her new divided page protectors, and she had word that they had arrived at amazon, and were ready for ordering. i placed my order about 10 minutes later. i wasn't playing around. lol! i'm a huge fan of using divided page protectors in my scrapbook albums. i have shared quite a few projects, where i have used them. including my school albums, vacation albums, and sports albums. i love the additional options that some of becky's new configurations will give me, when working these into my albums. there are the individual packs, which contain 12 pages in a pack. design A and B, have been around for a while. i had ordered these quite a while ago. i have a bunch of the design C already, but from a different manufacturer. i have used this particular configuration a TON in my albums (school, vacation, and sports albums especially). i think designs D and E are both fun options. i have ideas for both already. but my favorite has to be design F. i'm loving this one, and can't wait to use it! or you can get the big variety value pack, which contains 10 each of designs A, B, C, D, E, and F. this is the best value, if you think about it. and if you'll use each of those configurations. if you can't see yourself using a few of the designs, then i would buy them individually. there's also a value pack of just design A, which i'm assuming is one of her best sellers. if you're going to order at least 3 packs of this design, you might as well order the value pack, since you will get almost double for almost the same price. kwim? i love these big envelopes pages. these came in becky's school and baby kits, from years ago, and i love them. i actually found some plain ones, sort of like these, a long time ago, and bought a ton of them. i have one at the beginning of each year, in my albums. in my family albums, and in the girls albums. i use them to seperate the years, and to hold any random memoriabilia from the year. i ran out a while ago, so i'm really excited that these are now available. and i think the dividers will be nice to use too. they can be used to seperate the years, or events, or just to mark things in the album that you want to draw attention too. there are also regular 12x12 page protectors and 6x12 page protectors available. i'm well stocked up on 12x12 pages. but i ordered some of the 6x12, since i have used these in the girl's school albums, for adding in programs and newspaper clippings. if you want to see and hear more about these, becky has a video HERE. there is also more info on her website. 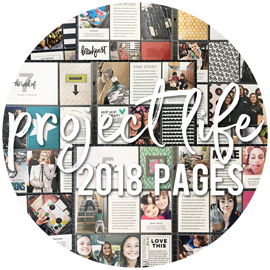 for the page protectors, and also her project life products. 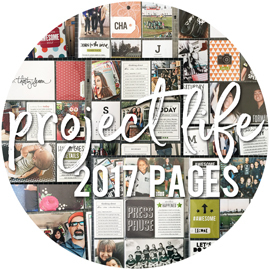 as much as i LOVE the concept of project life, and i set out to commit myself to it every year, i have yet to follow through on it. i completed one year. in 2009. i still have high hopes to work that in somehow. but i can definately say that i DO and WILL use all of these products. you can read my final blog post, and all about my thoughts on my style and how i incorporated it into this layout ... and see the entire layout, RIGHT HERE. thanks to MME, for letting me join them this month. i've had a blast! have you received your creating keepsakes november/december 2012 issue yet? i know this isn't the look/colors you'd expect for a december issue. you're probably thinking chrismas, right? well, don't forget it's a november issue as well. and i just love that CK decided to go with a fall color scheme and a thanksgiving/baking themed layout. i have to admit, i'm more partial to fall colors, than i am christmas colors. and i also love that they asked me to design the cover layout! i was given such a cute photo to work with, and personally, i love how it turned out. this issue is full of ideas and inspiration for thanksgiving, christmas, and winter layouts. you won't want to miss it! 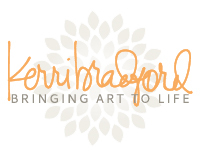 i had a layout go up at kerri bradford designs yesterday. since it's october, i thought it was fitting to create a halloween layout for my project. at first glance, this might not look like your average halloween layout. there's no orange. there's no purple. there is black, but not mixed with orange and purple. those are the colors normally found in most halloween collections. BUT. my girls don't usually choose costumes in your more traditional halloween colors. so when it comes time to scrap these photos, i definately look for more creative options to use on my layouts. the great thing about die cutting your own images, is that you can choose the colors and papers that you cut your shapes from. i almost always pull the colors for my layouts, from my photos. these photos of alyssa and sarah, along with their friend amanda, were from two halloween's ago. i pulled the aqua from my girl's costumes, red from amanda's costume, and green from the greenery in the background of the photos. i started with the grunge diamond background, which is from kerri's new foundations: trick or treat kit. i used this new aqua patterned paper, from bella blvd's new winter wonder collection. i knew i wanted this background to cover half of my layout. i simply cut the shape twice, both at 6 inches square. i knew my smaller photos would be covering the background design a bit, so i could cover where the two pieces met. i ended up cutting off a few rows of the diamond background at the last minute, to use on a card. i love the grungy look to the shape, with the little torn pieces here and there. this cut beautifully on my silhouette. next up, i knew i wanted to use this spider web, from kerri's this & that halloween: shapes only kit. i cut the spider web from black cardstock. i wanted it to go from the top to the bottom of the page. but i didn't want the shape to get too wide, since i only had 6 inches across to work with, on that side of the page. so i cut my shape at about 8 inches high. then i just cut off the top 2 inches or so, and adhered the two pieces above and below my photo strip. i decided on using the "BOO" title, that is also from kerri's this & that halloween: shapes only kit. i had already added some of this red and green pattern papers to the opposite side of my layout (both by bella blvd). so i cut my "BOO" title from both of those same papers, keeping them the same size. then i adhered the green letters on top of the red letters, using pop dots. i shifted the top letters to the side, just a tad, so that you could see the red letters peeking out from behind. i added a few rhinestones to the letters, to embellish them. one of my BFF's, lynn ghahary, has a challenge up in the garden at 2peas, for just this sort of idea. to scrap using non-traditional halloween colors. you can see her adorable layout and join in on the challenge HERE. today is the big day! the new mid-release collections, by bella blvd, are shipping out to a store/online store near you! 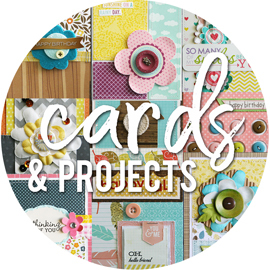 over on the blog, we are going to be sharing TONS of projects this week, from all of our designers, featuring our two new collections. head over HERE to check out what's up today! thought i'd share a taste of how we spend a lot of our friday night's, this time of the year. on the high school football field. the band getting ready to take the field for the national anthem, to start the game. see that little building, right behind the "manteca football" sign? that's the band's snack bar, where i do my share to help out, every now and then. last week just happened to be homecoming. and the first time i have taken my camera to a game. the manteca buffaloes, taking the field. because it was homecoming, and they were announcing the queen's and princess's during half time, the band didn't do their usual half time performance. but it was cool to see everyone out on the field, during the announcments. that's alyssa in the back. they were all really excited to wear the hats last week. NOT. they don't like the hats. or the uniforms, for that matter. they're really hot, and it was really hot last week. of course there are cheerleaders. lots of them in fact. i think my favorite part from the band, is at the end of the games, when they play. they do the school song, and then they play "R-E-S-P-E-C-T". and then they go into a bunch of other songs, and just have lots of fun with it. sarah and a few of her BFF's, tawny and natalia. they spend more time running to the snack bar and the bathroom, than they spent actually watching the game. and it's always a good night, when we have a scoreboard like this. with a buffalo win! i have a really quick and simple project up on the my mind's eye blog today. just a few ideas for creating fun little treats for a halloween class party at school. you can read all about them, find more photos, and hear why i created such simple treats RIGHT HERE. time to announce a winner for the free class pass that Shimelle has generously offered up for her new online class, Pretty Paper Party. what are the chances? the random number generator choose the first comment wins! i always laugh when i see kate's comments come into my inbox. "stinkydudette". too cute! congrats kate! i will forward your email address over to shimelle, and she'll be in touch with you! i'll be back a bit later today, with a simple little halloween project share that i created for the my mind's eye blog. There are online classes for everything these days, and Shimelle has been teaching online scrapbooking classes for years - but she's decided it's time to kick it up a bit and go from online class to a four-week online party, and you're invited. Pretty Paper Party is the party to attend if you have a collection of paper stacked up for a rainy day, if you have more scraps of paper than you know what to do with (but you know you don't want to throw them away!) and if you've ever put a piece of paper back in your stash because it was just too special for the photos at hand. Through printable prompts and tutorial videos, Shimelle and dozens of special party guests will share beautiful and innovative techniques you can achieve with the paper you have already collected. The party has barely started, and there are already goodies to hand out! Shimelle is offering up a FREE CLASS PASS to one of my lucky blog readers! Just leave me a comment, and give me a guesstimate (is that a word?) of how many inches of paper you have in your stash. I'll leave comments open until Tuesday evening, and then I will announce a randomly drawn winner on Wednesday morning. And if you've already signed up, you can still enter the giveaway. If chosen, Shimelle will refund the cost or you can give the class pass to a friend. Class starts today, but as with any good party, it's okay to arrive fashionably late. The class has no deadlines and everyone receives permanent access to all the class materials, so anyone can RSVP to the party at any time! yesterday, on the bella blvd blog, we had our first saturday sketch's post for october. this time, i decided to create a card sketch. i asked our card designers, as well as one of our layout designers to create projects based on the sketch, and i figured i would play along too. i used the new spring flings & easter things collection for my card. i usually follow sketches pretty closely. i think my main reason for following this one so closely, was that i was the one to create the sketch. lol! you can find my actual sketch, and see what all the other talented designers did, right HERE. it's challenge day on the my mind's eye blog today! The challenge: Design a card based on this wonderful sketch and use “FALL” as your theme (sketch by Anam Stubbington). The rules: Use ANY My Mind’s Eye products (current or past) as long as your project has at least 80% My Mind’s Eye products. The PRIZE: The winner will receive three ENTIRE collections of their choice! We will also award an honorable mention winner with one collection of their choice! All winners will be featured in a blog post and have bragging rights! the closest i could come to fall photos, were a few from the pumpkin patch, a few years back. these are the times when i really wish we had more of a "fall" season here. we get the fall weather. what we don't have much of, is the fall colors. the trees around here aren't grown up enough, to really drop that many leaves. not like in the movies, where you see the streets lined with huge trees and leaves ALL over the yards and streets. yes, i sort of want that look. lol! and our trees are pretty much green. we get a touch of orange leaves on one tree, and there's a few down the street with yellows. but overall, not a huge "fall" look around here. but i love fall colors, and i found lots of fun my mind's eye products in my stash, in fun fall colors. some of my papers are definately on the older side, mixed in with some newer ones. i went with browns, tans, blue, and a touch of orange and yellow. i love their buttons! such unique designs, with lots of texture. this transparency was meant to be a photo frame. but i thought it would be fun to use it as my journaling block. i adhered it to my layout, and then adhered my journaling strips right on top of it. we used transparencies in a lot of the classes i taught at CKC's this year, and i always got asked about the best way to adhere them. transparencies are clear, so they're a little trickier. but i simply adhere them with mini glue dots. i just try and put the glue dots behind a darker spot on the transparency, or behind a letter. if someone was to really look, they might see the glue dot just a bit. but i don't stress over it. and here's my card. i used scraps that i had out from the layout, to create the card. i love those banner stickers. they come on a sheet, with about 5 different colors, and they have the little letter stickers to add to them. i've been holding on to that sheet forever, and was glad to finally use them. 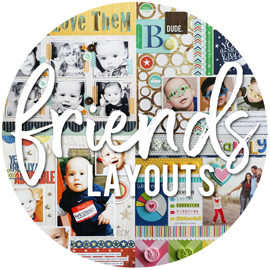 i have another layout to share, using one of bella blvd's two new mid-release collections. 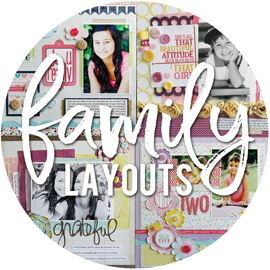 this layout also uses the new spring flings and easter things collection. but this time, it's more of a spring/everyday layout. as i was looking for the egg coloring photos on my external hard drive, i came across these photos of one of my closest friend's, deneen, and her girls. i had taken these photos of them, over four years ago, and thought it would be fun to scrap them. they went perfectly with this collection. i printed the photos of the four girls as 2x3's, and i believe the photo of all of them is 5x8 inches. i've had quite a few comments lately, on how straight my machine stitching is. honestly, it's really only straight when i do a zig zag stitch. and that's usually because i'm going along the edge of one of the papers. i just line up the center of the "foot" (is that what it's called? ), to go along the edge of my paper, so that the stitching goes on either side. if i'm doing a straight stitch, it will NOT be straight. so i purposely make it crooked as i go, and i make sure and go around three times. just like i did on these half circles. i did a little misting again, just to add a little color to the white cardstock. i did pull one pattern paper from an older bella collection, and that's the purple grid paper from the socialite collection. the flower paper along the side of the page, has a touch of purple in it, and i wanted to pick up on that. the scalloped border sticker is from the socialite collection too. the buttons are all from fancy pants. love their buttons! yesterday, it was halloween on the blog. and today, we're switching over to easter. lol! i've been playing with bella blvd's two new collections the last few days, and today i'm sharing a layout using the new spring flings and easter things collection. i managed to find some egg coloring photos that i have never scrapped before. somehow, 2007 never made it into the albums. i didn't have that many photos to chose from, so i picked out four photos that i could line up across the page. originally, when i trimmed them from my sheet of photo paper, i left a white border around each photo. then i remembered that i had sized them at 3"x4", so that they would fit perfectly across the page. i started to trim off all the white borders, and decided that i liked the look of one photo with the borders, to make it stand out more. i think you all know how much i LOVE my white cardstock. but sometimes, it's too plain looking, if i leave too much white space. for my taste, anyways. i'm trying to use my mists more now, and i have to say, i LOVE the way it adds a little sumpin-sumpin to the white cardstock. on this layout, i used my mister huey's, by studio calico, in bonny blue and lemonade. i'm definately new to misting, but i've read enough and seen it enough to have a slight idea of what i'm doing. i keep a box in my scraproom, that i can mist inside of. i even know to mist the areas you want, before adding your other papers and photos. and yet, somehow, i managed to mist two of my photos. and they weren't anywhere near where i misted. go figure. it landed on sarah's face, so i had to re-print them. i have another layout with this collection, that i'll share another day this week. remember to ask your LSS to order now, since it's a limited edition release. they start shipping on october 24th! last month, i mentioned a new feature that we're sharing, on the bella blvd blog. free step-by-step project sheets. i am designing a fresh, never-featured-before project along with step-by-step directions for you to use. every month! it will be complete with a list of tools, supplies and the bella products needed. well, our second one is up today. and here's a peek. head on over to the bella blvd blog, and you'll find the link to download the full project sheet. you can save it on your computer, or print it out to have on hand. i hope you enjoy! today is the last day of out design team introductions on the bella blvd blog. stephanie and i made a last minute decision to re-introduce ourselves, along with all the new girls. so i whipped up this quick layout yesterday. any guesses, as to what collection i used for this layout? the great thing about bella's pattern papers, is that you will always find super versitale patterns, that can be used for anything. at first glance, you might assume that i used a lot of pattern paper for this page. but i didn't. on both the green circle paper, and the yellow chevron paper, i simply cut some one inch strips. then i cut the ends at an angle, and adhered them up against each other. if you look closely at the photo above, you can see where the cuts are in the corners. i used a sheet of kraft cardstock, to build my entire layout on top of, so the strips sort of gave the look of a frame around the edges. so the entire middle part of the page was empty, and then i added my white cardstock piece in the center of the page, which covered up the empy spot. but not before i misted my paper. yes, you read that right. i misted something! took me forever, but i think i'm ready to jump on the misting train. lol! i used some "piglet" pink mist, from studio calico. the color worked perfectly. head over to the bella blvd blog, to check out who else we're introducing and re-introducing today. and you can also find 5 fun/random facts about me, which you may or may not know yet. i'm really excited to be joining my mind's eye for the month of october, as their guest designer! if you head over to their blog, you can read my post, where i shared a bit about myself and my family, how i started scrapping, and shared some of my favorite my mind's eye layouts from over the years. keep in mind, some are newer layouts. and some are super duper old layouts (like 4-5 years). i've used my mind's eye products since the beginning of time, and have always loved them! this was a new layout that i created over the weekend. i used the lost and found: sunshine collection, in great yellow, brown, and aqua colors. that yellow polka dot paper, on the background, is that great paper i mentioned before. with the glitter around the edge of each circle. i choose some of my favorite photos of us, from a family get-together back in june. i love all the cool frames apps and square photos that people are doing these days, with their iphones and smartphones. but i'm not cool enough to have a fancy phone like that, and i can't pry the girl's ipod touch's out of their hands long enough to use for taking photos. so when i saw the new insta-frames, by audrey neal, i knew i had to have them. it gives the same look, but i can do it with any photo i have. i just added the frames, and cropped my photos to fit. after printing these all out (at 2 inches square), i trimmed each one and adhered to my layout. in my head, i thought the 6 photos would fill up the space well. i must have mis-judged, since 9 photos would have worked better. so i just cut some squares of pattern paper, to fill in the gaps on my little collage. which worked out well, to handwrite just a few facts about the photos. i love the die cut title pieces, for pulling a layout together quickly. this one here says "such a lovely day". it also has glitter around the edges, which ties in nicely with the background pattern paper. i adhered it with lots of pop dots, and tucked some decorative pins behind it. the burlap trim is nice and thick, and added some great texture to the page. i adhered a strip of it down the left side of the page, and then embellished it with brads and buttons. you see the layered pieces? those brads come just like that, with the layered paper pieces behind them. they are so quick and easy to use. i love premade products like that! i'll be working on quite a few projects over the month, for the my mind's eye blog. i'm really looking forward to it, and hope you'll keep your eye out for me! today is reveal day for bella blvd's first ever mid-release! i'm so excited for these two new *limited edition* mini collections! what makes this morning even more exciting, for me personally, is that the UPS dude just dropped off a box a few minutes ago, containing all these new products!!! i cannot wait to create with these gorgeous new papers and stickers! i'm only going to show you a few pieces from each collection. you'll want to check out the bella blvd blog, to see the collections in full! you can see the winter wonder collection here and the spring flings and easter things collection here. i admit, that we don't have anything that resembles "winter" here in my part of california. lol! but i can think of plenty of uses for this collection, since the patterns are so versitile. aren't the designs gorgesous, fun, and full of color! there are also a few new miniature stickers being released, which have turned into one of bella's best selling items. make sure and check out the blog, so you can see every single item in each collection. and we have giveaway's too, so be sure and get your name in there for a chance to win these! a birthday card! the one kind of card that i NEVER have on hand. and the one kind of card that we always need the most of. it never fails. one of the girl's will have a birthday party to go too, and 10 minutes before we need to leave, i'm rushing to make a card. which is why most of my birthday cards look like this. 2 pattern papers, a strip of ribbon, and a sentiment sticker. done in this same arrangement. it's quick and easy. i have a layout that i created a few days ago (will share next week), and i had some scraps left over. so i used some of those, to make a quick card, while i had everything out. those layered embellishments come, exactly as you see them. so i literally just peeled them off the sheet, and stuck them down on the front of the card. easy peasy.